As famous chess manufacturer, we have exported our product to many countries. Western and Europe are the most countries which often buy our product. Our western customer always satisfied with our product, because we have the best quality product. Our product made of the best main material that is Teak wood which has known as the strongest wood in the world. So that our product is durable in any seasons and perfect for outdoor use. The picture above show you about a giant chess set which put outdoor in Edmonto city, Canada. That is the prove about our existence in western country. All people are love giant chess. 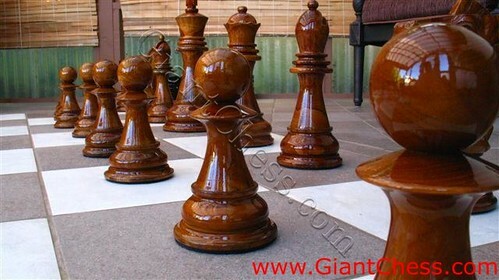 It because our giant chess has carved beautifully by expert craftsman and polished well to get an elegant looks.